Carl Francis Samsock, a retired firefighter, former Marine and beloved father and grandfather, passed away peacefully on July 19, 2018, in Rockville, MD, after a short illness. He was 88. Born in Taylor, PA, Carl grew up in a big family, with 12 brothers and sisters. They weren’t wealthy – his father was a coalminer – but they were strong, hardworking, faith-filled and proud of their Polish heritage. After graduating from the former Taylor High School in 1947, Carl joined the United States Marines and served his country proudly. He then moved to Washington, D.C., where he became a firefighter, serving in the upper Wisconsin Avenue, Northwest D.C. station, Engine 20, Truck 12. On emergency calls, Carl was often called on to lead the way by using the Halligan tool to pry or punch open locked doors so the company could get to a fire. Over his long career, Carl saved a number of people from suffering serious injuries or death from fires. He was even recognized in one newspaper account for his heroics in helping to save a woman whose bedroom was engulfed in flames. While living in the Washington area, Carl married Peggy Mullins, also a native of Pennsylvania. Together they had two sons, Carl Jr. and Michael, and they enjoyed many happy years together. When Peggy suffered a long illness, Carl helped care for her at home until she passed away in 1989. After retiring as a firefighter, Carl enjoyed spending more time with his family. 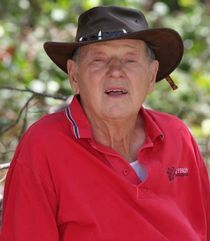 He lived with his son Carl's family in Maryland and in Australia. He loved to travel, visiting places like New Zealand and Alaska. Carl was known for his wonderful sense of humor, his wise counsel, his faith in God, and his devotion to his family. He loved to dance the Polka, listen to country music, garden, drink coffee with family and find a good bargain at the grocery store. Carl could throw horseshoes with the best of them, happily competing against family members at annual Fourth of July gatherings in Pennsylvania. A Memorial Mass will be held on Wednesday, July 25, 2018 at 11am at St. Patrick's Catholic Church, 4101 Norbeck Rd., Rockville, MD 20853.